As an additional strategy for Economic Empowerment, the Jeffries TRAVEL Network & BLACK STAR Empowerment Group are fundraising components, incorporated as strategic partnerships, which can provide a means of EXTRACTING our monies spent in the largest and still growing $8-Trillion dollar Travel Industry and then RE-CIRCULATING those monies and benefits, back into the hands of our own Families, Communities & Institutions, etc. We offer GREAT TRAVEL PRICES to Customers, while EMPOWERING the Lives & Legacies of our Members of the Jeffries TRAVEL NETWORK with an ARRAY of AWESOME BENEFITS! Some Additional MEMBER BENEFITS includes VIP Travel ACCESS, Travel the WORLD with DEEP WHOESALE DISCOUNTS… GET FREE Vacations… Access SOFT SKILL LEADERSHIP Training, Earn Extra INCOME, REWARDS & CASH BONUSES… Enjoy Great TAX BENEFITS &/or Get some well deserved TIME FREEDOM!!! FIRST, we invite you to EXPLORE some GENERAL OPTIONS OFERRED BELOW by the Jeffries TRAVEL NETWORK, then REGISTER for MORE info in all areas of your interest! BOOK YOUR OWN TRAVEL ONLINE or SEARCH RATES & COMPARE OUR PRICES with Expedia, BookingBuddy, etc! Please NOTE: Many various Tours & Excursions can be booked directly on the Jeffries Travel Portal site, however, CULTURAL HERITAGE TOUR PACKAGES with Dr. Leonard Jeffries are BOOKED Directly with a Travel Agent & not posted on this website at this time. REGISTER NOW to get your FREE 30 DAY ACCESS to our WHOLESALE TRAVEL PORTAL- and sample the Jeffries Travel Network as an exclusive CUSTOMER! You'll experience ourSAVINGS & GET DISCOUNTS and the Jeffries Foundation will be able to use the rewards points accumulated towards supplies, etc for their hosted activites, etc! - Your RISK-FREE test drive is accessible from around the Globe 24/7 with internet access. You'll be AMAZED at the HUGE SAVINGS on your Travel Bookings & SHOPPING! However if you choose to become a member of the Jeffries TRAVEL/Vacation club, then you too will earn REWARDS POINTS & CASH BONUSES to expand your Travel DISCOUNTS & KEEP MORE MONIES circulating in your HOUSEHOLD! There are also some income opportunities available with this option for additional economic empowermnent of families, and institutions in our Community, etc. REGISTER for UPCOMING HERITAGE TOURS! Professor James Small leads in Cultural Heritage African Tours Annually to the MOTHERLAND! This awesome African Pilgrimage includes destinations like Ghana, West Africa, with continued Homage to our Ancestors, Participation in Emancipation Celebrations like PANAFEST, Ceremonies Honoring our Great Nubian Legacy! Includes nights in Ghana, staying at the Sanaa Lodge in Cape Coast! * please note the Jeffries are being honored in Selma as the "Couple of the Struggle" & won't be in Ghana for the March tour., however Dr. Leonard Jeffries plans to be on the Tour in July 2017! REGISTER NOW to request information on our TRAVEL AGENT CERTIFICATION & TOUR SPECIALIST Career programs! Referrals and Affiliate Partners are also welcomed. Members who choose to help promote & marketthis empowerment project, will recieve acknowledgements, get credit, Earn referral commissions & more!. Very lucrative Commissions are offerred to those looking to work part time &/or from home, .No experience needed. Will Train those who are coachable and comitted to bettering their lives in the Spirit of Ujima (Collective Work & Responsibility) . Portions of the proceeds of Travel services rendered, and/or membership fees, will go towards financially fundings the mission and works of Drs Rosalind & Leonard Jeffries Foundation, Inc, the Jeffries LEGACY PROJECT and/or other Institutions within the Diaspora of the African Golden Circle.. THANK YOU for taking time to Explore our Travel Services! We hope you requested more information or accepted our FREE Offers! We LOOK FORWARD to you JOINING as a MEMBER or Partnering with the Jeffries TRAVEL NETWORK , or using our Travel/ Tour Services as a liberated Customer. Either way, please share this valuable information with others! 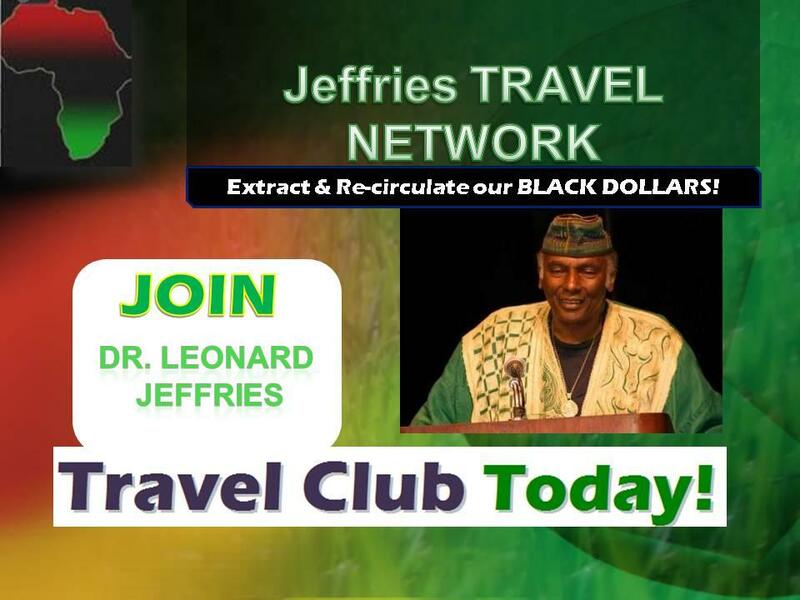 REGISTER for MORE INFORMATION on HOW to BECOME a MEMBER of the JEFFRIES TRAVEL NETWORK, by VIEWING our ENTIRE TRAVEL PROGRAM in order to EXPLORE the many OPTIONS & VARIOUS WAYS you may ACCESS BENEFITS & EMPOWER YOURSELF, which can also automatically help CONTRIBUTE to the LARGER VISION of the JEFFRIES LEGACY PROJECT & MORE! FOR INFORMATION on UPCOMING EVENTS hosted by the Drs Rosalind & Leonard Jeffries Foundation, Inc, please visit: HTTP://Jeffrieslegacyproject.eventbrite.com or visit http://facebook.com/leodardjeffries for more information & updates on the Jeffries Foundation's other monthly activites! NEXT ECONOMIC EMPOWERMENT/TRAVEL EVENT: On Thurs Nov 16, 2017- Dr. Leonard Jeffries is invited to be a special guest speaker, sharing their Jeffries LEGACY Project fundraising initiative with TRAVEL PARTNERS & GUESTS. Please Note: The Jeffries Travel Network sector, will also have a mini -Display featured during many of the YEAR LONG ACTIVITIES of the LEGACY PROJECT Fundraising EVENTS! . We look forward to seeing &/or servicing you soon! !